Facet joint instability is a potentially very serious result of various types of injury, degeneration and mechanical dysfunction. Instability in any bodily structure is never good, but when the actual spine becomes unstable, the patient might suffer widespread problems with pain, posture and basic physical functionality. Unstable zygapophyseal joints are not the worst type of spinal instability by any means, since these joints are not really weight bearing. This is a very good thing for most affected patients. However, since the facet structures are responsible for maintaining overall stability of the spine, linking vertebral bones together and regulating range of spinal motion to prevent injury, instability can still be a very serious matter of concern. This essay explores spinal instability that is expressed in the facet joints. We will detail the underlying mechanisms that can result in unstable apophyseal joints and what can be done to restore stability in the affected joints. What is Facet Joint Instability? All bodily joints demonstrate certain parameters that can be rated in terms of range of movement, resistance to movement and actual mechanics of movement. When all of these rating factors are normal or close to normal, the joint will always be stable. Sometimes, the various criteria of joint rating can become very atypical, but stability can still be maintained. This is due to the body’s amazing ability to compensate for differences in form, positioning and functionality. However, when the rating characteristics of the joint continue to progress towards more atypical degrees, there is an ever-increasing chance that the joint will lose structural stability and fall into dysfunction. Stability is a rating of predictability and volatility in the joint. Normal, stable joints are not volatile at all and are very predictable in their expected movement and resistance to movement. Meanwhile, as joints progresses towards greater degrees of instability, their movements become less predictable, less regulated and much more volatile. Basically, this means that instead of doing its intended job of regulation of motion, the joint breaks down and allows the laws of nature to have free rein over the mechanics that occur within. Once complete instability has occurred, serious symptoms are virtually guaranteed to exist and the patient will likely be greatly limited in mobility of the affected area without severe consequences. Since the entire spinal anatomy is interdependent and relies on every other part to correctly perform their anatomical function, instability in one joint can actually affect a wide range of related tissues and negatively impact overall physical function. Zygapophyseal joints can be affected by mechanical instability when osteophytes prevent full movement of the joint, lock the joint in a frozen position or change the trajectory of joint movement. Facet tissues can become temporarily or permanently unstable due to soft tissue inflammation that can swell parts of joint to the extent where they misalign or do not move properly or at all. Ligamentous dysfunction can also cause instability in the facet joints. Ligamentous problems can cause the joint to become hypomobile, which prevents movement, or hypermobile, which causes unstable and erratic movement. In very rare cases, inability can resolve through the use of conservative care, such as physical therapy. This path is best suited for ligamentous problems. Most varieties of facet joint instability are caused by mechanical dysfunction and will either resolve naturally as the bone spurring wears down or will need to be treated surgically. Virtually all forms of facet instability can be rectified using focused surgical interventions. 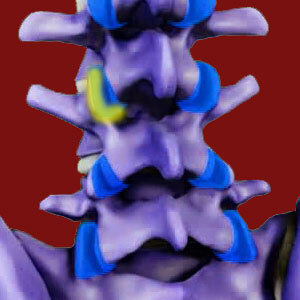 Instability can be very painful and might cause a cascade effect of problems thorough the spinal anatomy. Instability might also contribute to worse facet-related conditions, such as dislocation or fracture of the joint structure. For best results in treating facet joint instability, it is advised to seek expert evaluation from an orthopedic specialist who focuses on the spine.